Remember what I had mentioned in my last post about reasons why customers would stop shopping from your online store? …retaining a customer is far less expensive than it is to acquire a brand new one. Instead of being constantly worried about driving new traffic to your eCommerce business, why not focus on what you currently get and try improving conversions. You already spend money driving these new shoppers, but are you certain you’re delivering a great shopping experience? Are you monitoring what customers do on the website (mouse tracking, heatmaps, recording sessions)? Are you asking them questions while they shop (web surveys)? 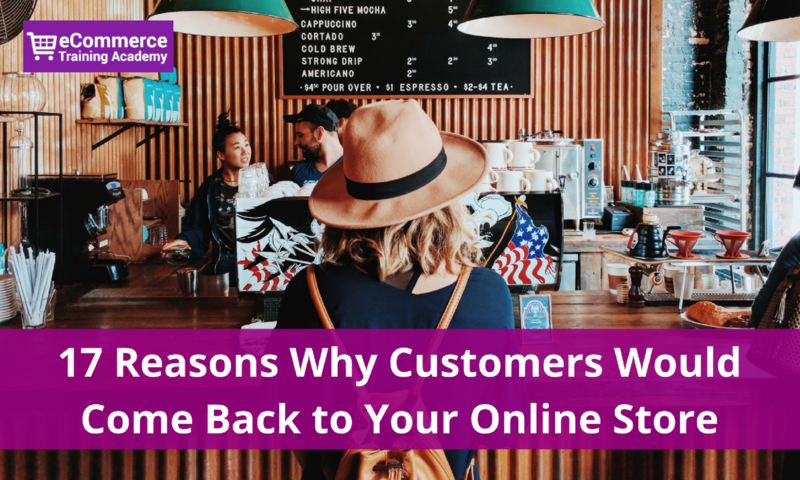 You need to understand reasons as to why customers would revisit your website. This will help you focus on key areas of your online store such as your homepage, header, navigation, product categories, product pages or user account areas. I’ve gathered a list 17 possible reasons to help you save time. One of the main reasons as to why you have an online store in the first place is to allow customers to purchase your products from the comfort of their home. Personalizing the experience will help increase sales. TIP: Provide them an easy way to search or browse by popular categories or related items. Monitor what categories shoppers browse the most as well as what search terms are being used on site. This will help you merchandise better. Not only would customers return to purchase new products, but they might also want to reorder some items. Examples of such products could be ink for their printer, diapers for the baby, beauty products or fresh coffee. TIP: Provide an easy way for customers to view past orders through their account as well as adding a simple reorder option. A customer may visit your website to view the status of a recent order they’ve made with you. TIP: Provide a link within their account to view recent orders as well as adding a link in the footer for “Order Status” or “Track My Order”. A customer may visit your website to request a return on a item they’ve recently purchased and received from you. There could be a couple of reasons as to why they would return it such as the item not meeting their expectations, wrong size or is damaged. TIP: Provide links within user’s account as well as the footer to your return policy/procedures, your contact information as well as FAQs. When customers need product support or have questions, they will visit your website to seek some help. TIP: Remember to include in your header and footer links to help pages. Another idea is to include a link to help resources for that specific product within their order history or on the product page itself. Customer will visit your online store to see what’s new as well as what are the latest promotions. TIP: Consider adding a section for new arrivals and sales promotion within your main menu or site navigation. You can also add links to it from your top department/category pages. If you’re actively seeking feedback from customers about their recent shopping experience with your brand, they will visit your website to provide you this feedback. TIP: Make it easy for customers to leave you a feedback either by providing a link within their last order information, user account or via 3rd party. Let’s face it, all retailers run out of stock of certain items at one point. While some might not wait for you to get back in stock, some will check your site or would want to be notified when it’s available. Who doesn’t love a bargain. If a customer is thinking of buying an item from you, they might visit your website multiple times to see if the price changes over a specific period of time. TIP: Consider adding an option on your website for price drop alerts especially if you’re in a competitive industry. A customer might login to their account simply to view their order history or print an invoice for accounting purposes. TIP: Display an “order history” link within their user account or within the footer of your store. If you have a brick-and-mortar presence, customers might visit your online store to view store locations, stores hours or store phone numbers. TIP: Provide a link within your header or user menu to view all store location details. You might want to consider adding this link in your footer and within your email communications. Price comparison is very common among online shoppers. Before we buy something, we want to make sure we’re paying the best price or getting the most value for our purchase. TIP: Ensure that you monitor competitor’s pricing so that you remain competitive. Before buying a product, customers may want to read reviews left by other shoppers to help them decide if the product is right for them. They may want to write one about a product they’ve recently bought from you. TIP: Display reviews on product pages since that’s where customers expect them. Show options of writing reviews or simply rating products. Your customers may not be ready to purchase a product at this moment, but they may want to save it in their wish list for future consideration. TIP: Remember to display an “Add to Wishlist” option on product pages as well as an option to view their saved wish lists within their account. If customers love shopping from your brand, they might decide to purchase a gift card for someone. TIP: Include a gift card category within your store navigation. Remind shoppers on product pages that you offer gift card options. Also, consider offering gift wrapping services as well as adding a greeting cards. If you have an inbound marketing strategy in place where you consistently create interesting content, customers will visit your website to read what you’ve recently published since it has value to them. TIP: Make sure to link to your blog either within your main menu or within your footer. Consider promoting your latest content in your newsletter as well so you can drive traffic to your blog. Do not limit yourself to blog posts. You can create videos and beautiful lifestyle pictures. Customers might simply want to update their account information including email address, shipping, billing and credit cards on file. TIP: Provide easy options within user accounts which help customers update their information with ease. Make sure to also add a link to customer support within that section of the website in case they run into difficulties. When you focus on improving conversions with your current website traffic, you will experience improved overall performance throughout your marketing initiatives. What’s important is to understand how your customers think, what are their needs and how they behave in your online store. One more thing! Don’t forget about mobile. A big percentage of return customers will revisit your store through a mobile device. Monitor mobile traffic separately because it will be different from desktop behaviour. It was very informative and useful.